You know the classic motion of using your fingers to snap photos with an invisible camera? Well, I am glad to say that such an idea has been translated to the real world in the form of the Air Clicker, and this particular device comprises of a couple of modules – one for the thumb, while the other is meant for the forefinger. The camera segment will be worn on the thumb, while the shutter button itself is triggered by a bent finger, similar to a beckoning action. If you prefer to shoot videos instead of stills, all you need to do is curve your fingers to imitate a video camera grip – don’t you think that it is all too easy? We do know that the Air Clicker will be Bluetooth powered, but it would be nice to see some description on the device’s battery lifespan as well as amount of memory space. After all, shooting video (as well as knowing the resolution count of the camera would help a great deal) tends to take up a whole lot of memory within a short time. 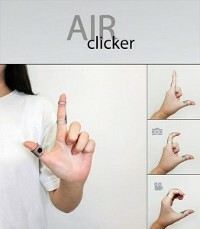 Do you think the Air Clicker will catch on in the long run?